Countdown: Annabel Lee & Others | Who Killed Orrin Grey? The folks at Lurker Films have long done a series of DVDs featuring H.P. Lovecraft-inspired short and independent films which I, shamefully, have never watched even one of. But when they rolled out their series doing the same thing with Edgar Allan Poe films, and the first volume included a stop-motion one, I went ahead and took that plunge. And since yesterday marked the 151st anniversary of Poe’s death, it seemed an appropriate time to watch it. First of all, a word about Lurker Films in general. I’ve heard great things about them, and I fully, 100% support what they’re doing. One of these days, I’m going to knock out every one of those Lovecraft movies, I guarantee it, and I’m pretty excited about the Yellow Sign one, too. So if I say anything mean below, don’t take any of it to heart. The DVD I watched (The Edgar Allan Poe Collection Volume 1: Annabel Lee and Other Tales of Mystery and Imagination) consists of the aforementioned short stop-motion film of Annabel Lee, as well as two live action shorts of “The Raven” and “The Tell-Tale Heart.” I’ll tackle them one at a time. The main event for me. I’m a sucker for Poe stuff, and even more of a sucker for stop motion, so this seemed like a no-brainer. How’d it turn out? Well, I can say with confidence that it’s the best Nine Inch Nails video that was ever an Edgar Allan Poe poem. The movie consists of somebody reading the poem “Annabel Lee” while a puppet version of Edgar Allan Poe wanders through (mostly) a hideous, twisted, expressionistic underworld. The visuals are mostly really great. I’m not sure that all the wire and nails and skull-headed baby dolls are exactly what I think of as Poe-ish, but it all looks very good. 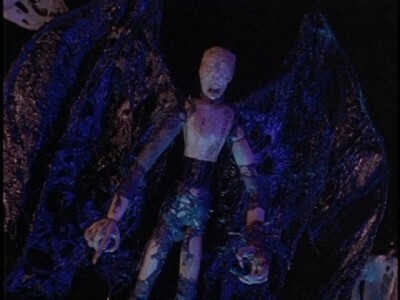 The animator does a great job of working in the inherent creepiness of dolls and puppets, and there are some great visual touches, like the scenes when the Poe puppet is suddenly held up by wires. Unfortunately, the narrator seems to be reading the poem in his best Batman voice, which detracts a lot. I’d recommend putting on the film, muting it, playing your favorite appropriately spooky music, and just pretending it’s a music video. It also bears noting that, as the longest film of the three, it clocks in at around 18 minutes. Another one that consists entirely of a narrator reading the title poem over the proceedings. The narrator here does a much better job, at least, and the film itself, while very simple and spare, is pretty effectice. The only problem I had, really, was the painting of Lenore changing its expressions, which read as a little silly to me. I even liked the papercrafted raven, though I think they should’ve found some way to make its beak move when it said “Nevermore.” Around 10 minutes. A very loose Spanish-language adaptation of Poe’s “The Tell-Tale Heart,” starring horror legend (though this is actually the first thing I’ve ever seen him in) Paul Naschy. Very short and, to me, fairly pointless, changing the tale so as to eliminate several of the most interesting parts of the original story. Nicely-enough shot, but not much more. Around 5 minutes.